Ever want to watch your team's game, but work sends you traveling? Move to a new city and trying to find a bar where the patrons aren't hostile (That's ME!)? 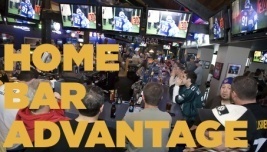 Want to show how much better your team's bar is than your rival's bar? Note: This may be best created as a foursquare app. We'll see where this idea takes me.